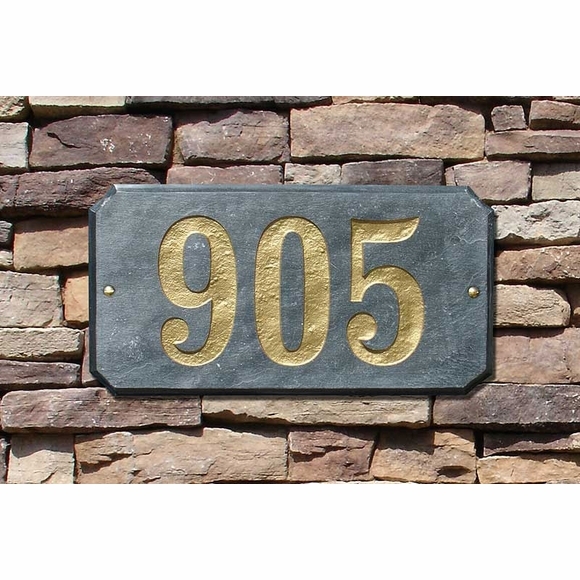 Personalized Granite Address Plaque with extra large 6" Numbers - - cut corner rectangle solid granite address plaque. This imposing address plaque holds up to four (4) deeply engraved 6" numbers. Mounting hardware for wall installation included. Optional lawn stakes sold separately; see Related Products area at right. GRANITE COLORS: autumn leaf natural, black polished, black natural (discontinued), emerald green polished, five color natural (shown above with black numbers), quartzite natural, sand granite polished, sand granite natural (discontinued), white granite natural.